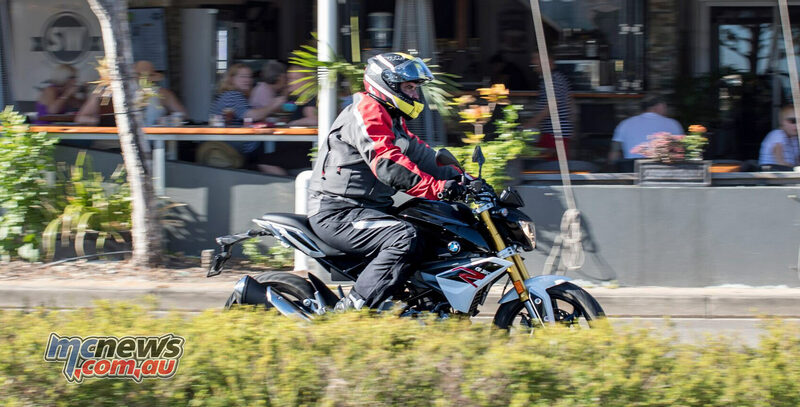 After recently covering 7000km on the biggest and most well appointed machine in the massive BMW line-up, the awesome K 1600 GT, it was a ‘Honey I Shrunk The Kids’ type experience hopping aboard BMW’s new learner legal G 310 R for the first time. BMW hope this affordable new model will attract a legion of young new customers to the marque. To achieve the less than 7k ride away price point BMW had to make a quantum shift in their traditional manufacturing procedures. 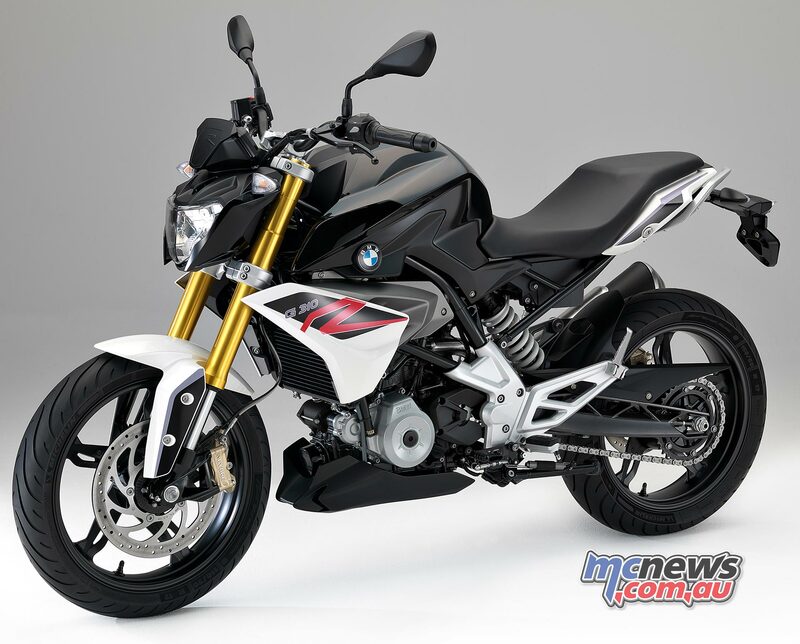 This has seen BMW manufacture a motorcycle outside of Europe for the first time. 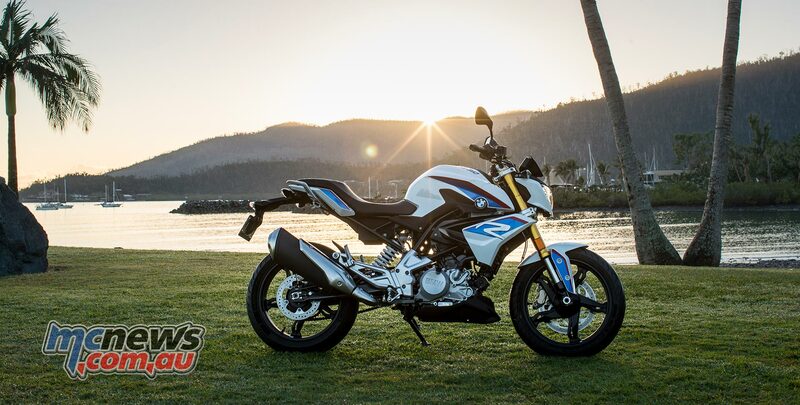 Partnering with major Indian manufacturer TVS allows lower manufacturing costs, which delivers a motorcycle at a price point that BMW hasn’t visited for many decades. With an annual yearly production volume of three-million vehicles, and export footprints in more than 60 countries, TVS is a massive player in the manufacturing industry. 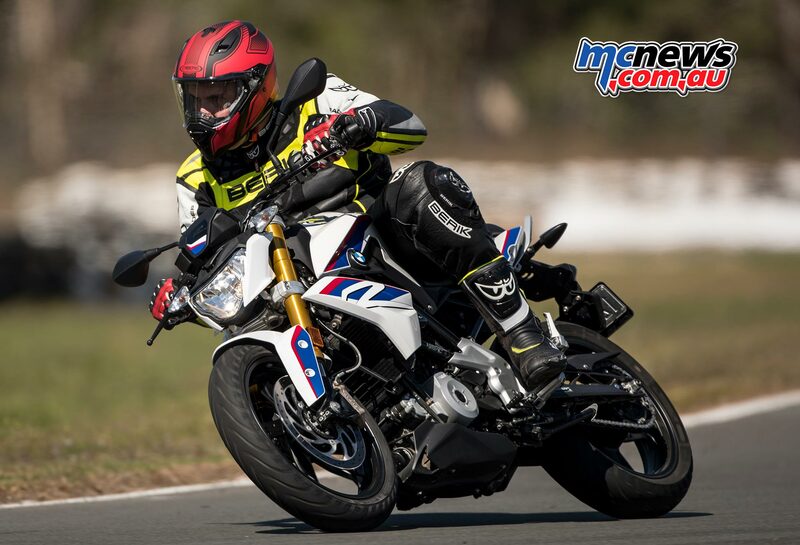 Adding lower capacity and lower cost models to the BMW Motorrad range is a move to achieve sales growth across emerging markets throughout South America and South-East Asia, but also serves as a useful entry point for BMW Australia in order to try and lure new riders across to their brand. 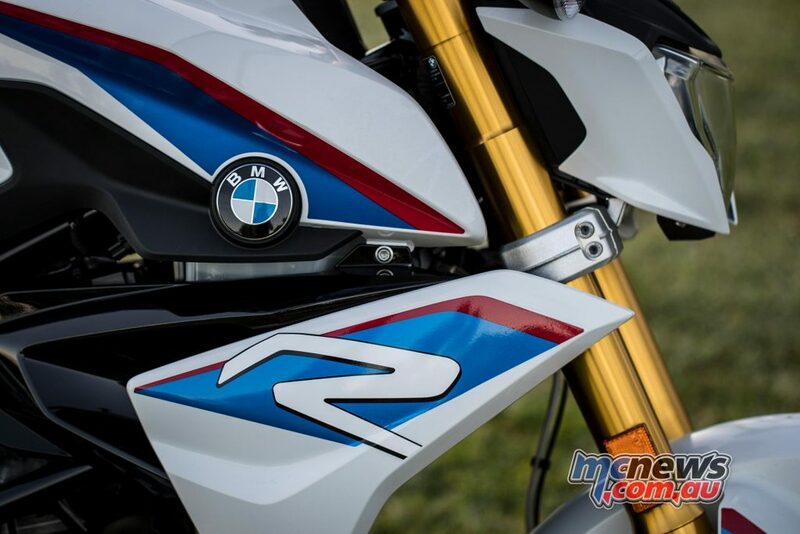 With the eventual aim, of course, that riders then stay with the brand, eventually climbing rungs up the ladder towards BMW’s higher end models. The G 310 R was expected to arrive late last year, but the launch was delayed to ensure TVS could meet the strict quality control guidelines set down by BMW. 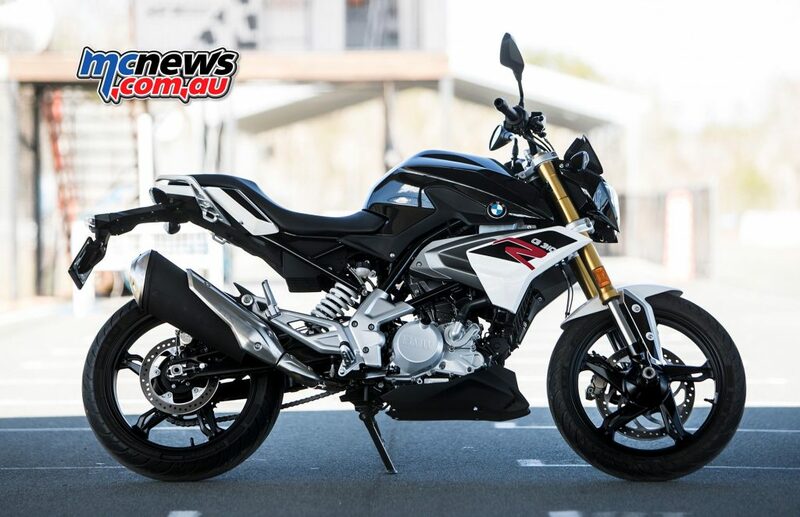 Now confident that the bike is a polished product, BMW has only just started to enter markets one by one, and Australia, funnily enough, is one of the first to receive this new model. Presumably that’s because our relatively minuscule market is so easily serviced in regards to volume. For massive markets like India, where the machine is manufactured, the G 310 R is still yet to be released, as the production volumes required to meet potential demand dwarf our market. For every one road motorcycle or scooter sold in Australia, there are 300 sold in India. 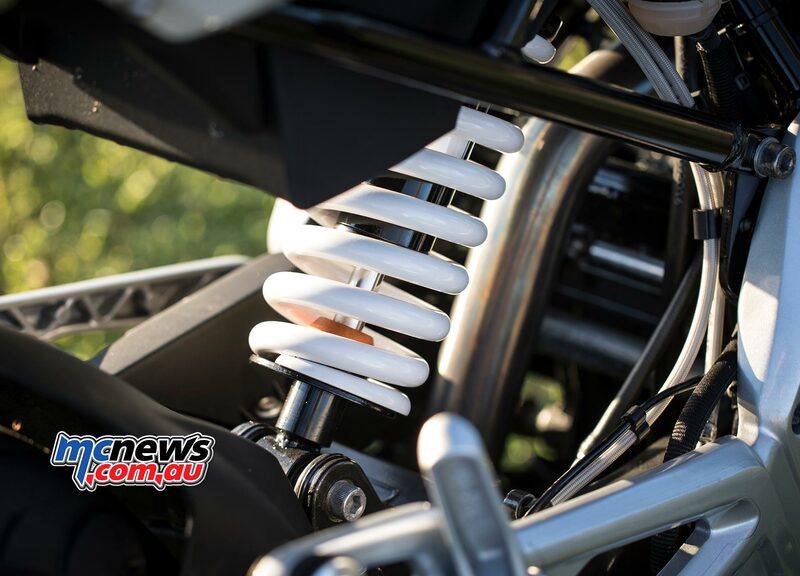 In powering the machine BMW have gone away from their twin-cylinder roots and instead gone the single-cylinder route for their new LAMS offering. 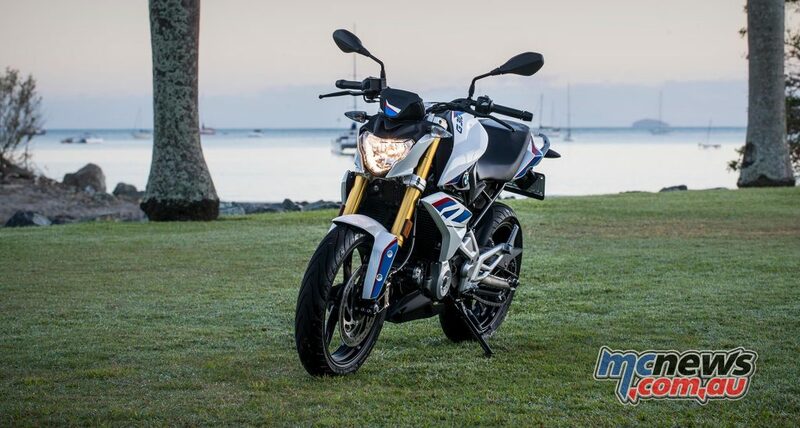 Funnily enough BMW’s last dalliance with single cylinder engines was also outsourced, with Rotax producing the 652cc single that did duty in models such as the F 650 GS and G 650 GS. A relatively short-stroke 313cc engine, sees its rearward slanted 80mm bore cylinder topped by a cylinder head mounted 180-degrees from established conventions. A 42mm throttle body is situated at the front of the machine, while the stainless-steel header pipe exits rearward. This is a design sometimes seen on single-cylinder motocross machines, designed to help lower the centre of gravity and simplify exhaust routing. BMW claim 34 horsepower at 9500rpm and 28Nm peak torque at 7500rpm. 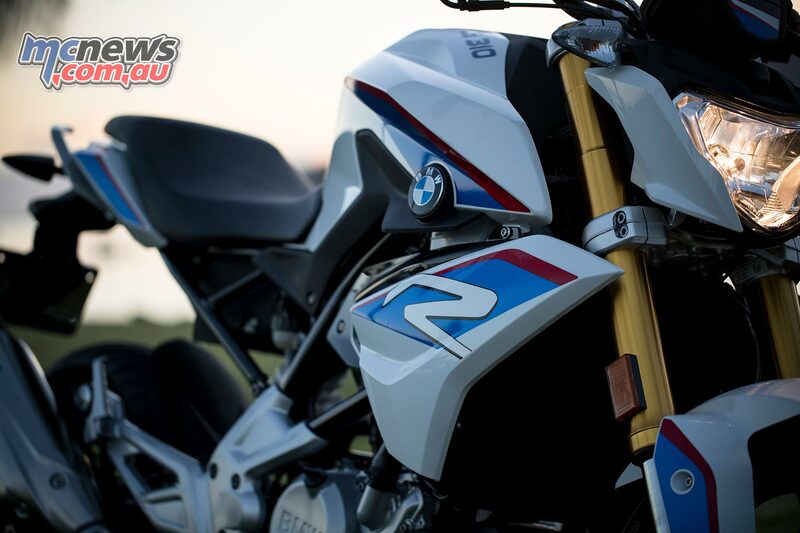 With only a single lung the BMW does not have quite the top end pull of twin-cylinder machines such as Yamaha’s MT-03 or YZF-R3, or Kawasaki’s Ninja 300. It is comparable to Honda’s CBR300R, but without a back to back test it is hard to quantify which manufacturer has the edge. 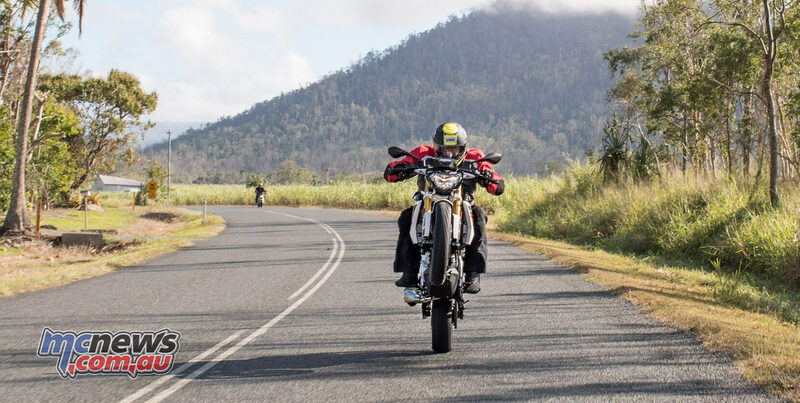 KTM’s 390 Duke is another competitor, is a single-cylinder like the BMW, but with a 60cc capacity advantage offers a fair bit more grunt than the G 310 R.
At 10.6:1 the compression ratio is on the low side for a modern engine, which suggests it is a low-stress design with a significant emphasis on long-term reliability and, as the model has a definite target market in emerging economies, also perhaps to help prevent low quality fuels from causing any engine damage. However, BMW does still curiously recommend a minimum 95 RON fuel. It is a modern DOHC design complete with DLC coatings on many of the internals and a Nikasil lined cylinder bore. 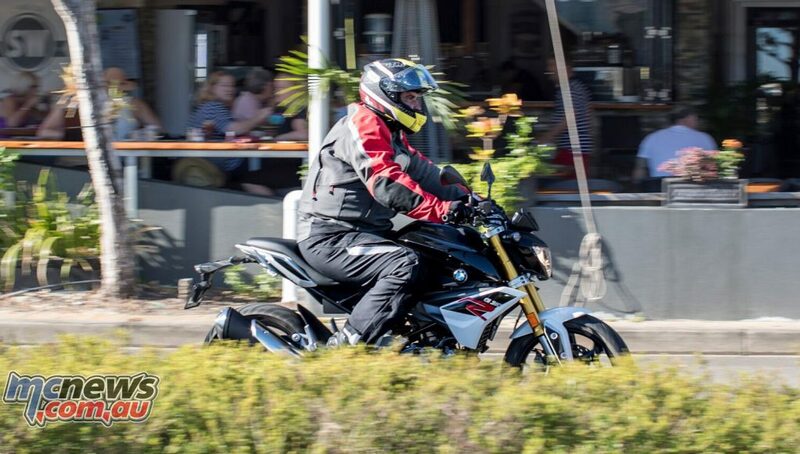 BMW claim 3.3 litres per 100km fuel use under the official WMTC economy testing regimen giving the G 310 R a range of over 300 kilometres from the 11-litre fuel tank. Services are required every 10,000km with valve clearances checked every 20,000km. The fuel-injected engine pulls through to 10,000rpm and achieved a best speed of 146km/h during my day on the bike. At the very demanding Proserpine go-kart circuit I could easily make the entire 1km lap in third gear. As cornering speeds raised later in the afternoon there was a couple of spots I was using fourth, but even through the tightest turns third gear was as low as I needed to go all day. There is no fly by wire system on this machine but a conventional cable running to the throttle body and gave me no reason for complaint. The nicely progressive mechanically actuated clutch also proved perfectly amenable. Everthing feels easy, natural, and none of the bikes appeared to get hot under the collar despite the hard work they did at the track, in what were fairly oppressive conditions. Kayaba provide both the 41mm inverted forks and PDS style shock absorber. I must admit I raised an eyebrow at the lack of a rear shock linkage and questioned why BMW would go this route. 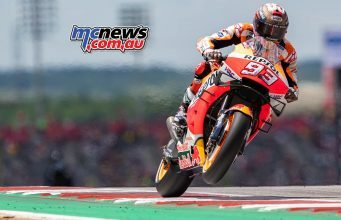 I can only imagine that saving a little on production costs is the reason BMW chose a rear suspension design that only KTM has successfully made work. However, the suspension actually turned out to be the standout feature of the new G 310 R for me. I started the day with minimum preload on the first road sections and the damping was well controlled. I upped the preload to two positions from maximum in its ten-position range for the remainder of the road ride and left it at that setting for the track. The forks are quite plush in the initial part of their stroke, which leads me to believe that progressive rate springs are inside those handsome 41mm gold fork stanchions. 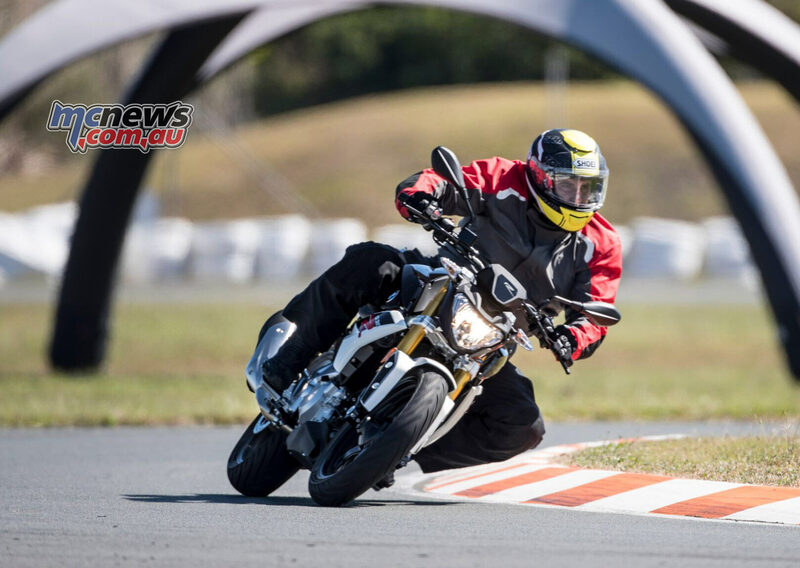 They firm up as they enter the middle part of their travel and proved capable of coping with some pretty aggressive riding at the kart track without complaint. With a fairly generous 131m of rear travel and 140mm at the front I certainly did not expect the excellent level of damping control that the G 310 R exhibited. Very impressive indeed. 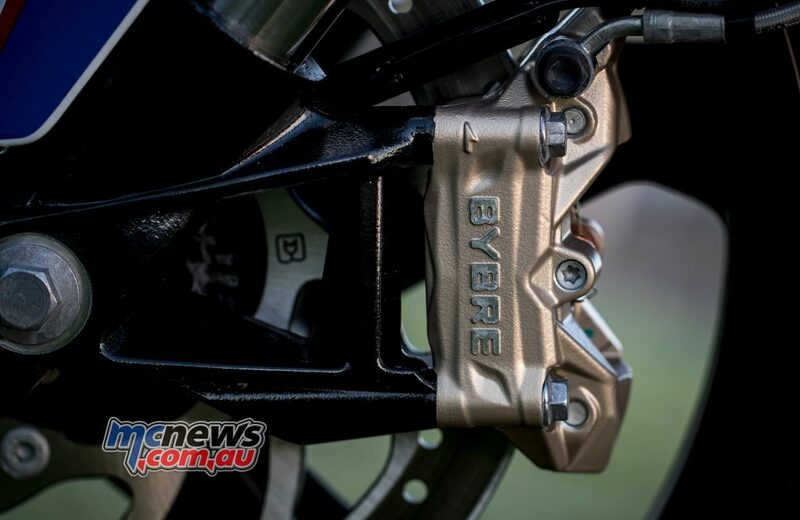 A single 300mm front disc rotor is clamped by a four-piston radial mount front caliper branded BYBRE, a lower cost Indian subsidiary of Brembo. The brakes worked well enough for the target market, never faded, but did not impress me as much as the suspension package when really getting up it for the rent. Braided lines are fitted as standard and BMW chose a high-end two-channel ABS system produced by Continental to aid rider safety. A brilliant system that never once impinged progress on track. Big thumbs up. The 110/70 (F) and 150/60 (R) Michelin Pilot Street Radials were the only thing holding us back from increasing speeds on the track. They held up remarkably well, considering, but were certainly approaching the outer limits of their performance envelope when the pace hotted up. Dropping pressures down to around 30psi certainly helped front end grip when charging hard into turns. A reasonably lurid third gear slide from the rear on to the main straight helped warn me that was about as fast as I was going to go on the standard rubber without taking too many risks. The machine turns well, holds a chosen line predictably, but is agile enough for easy corrections when already committed. The LCD instrumentation is attractive and informative. 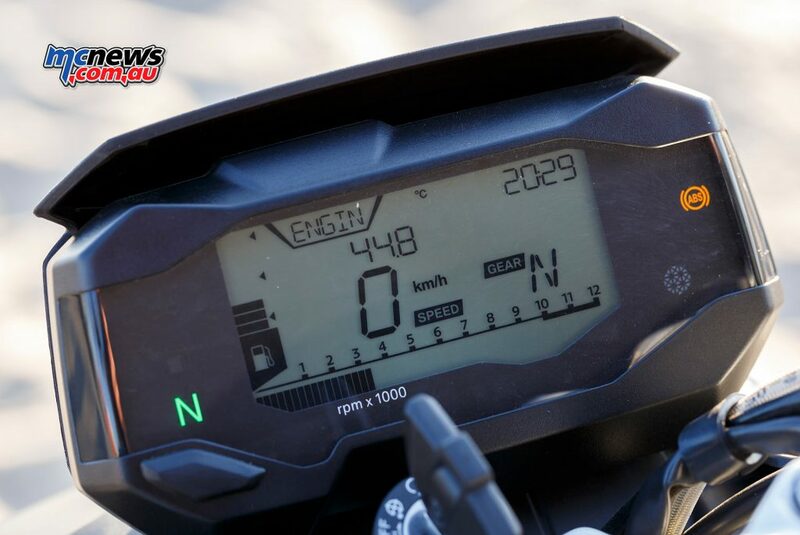 A gear position indicator, fuel gauge and range countdown handy features for any rider, but particularly beneficial to those just starting their two wheeled journey. While the machine looks quite small it actually proved quite roomy. 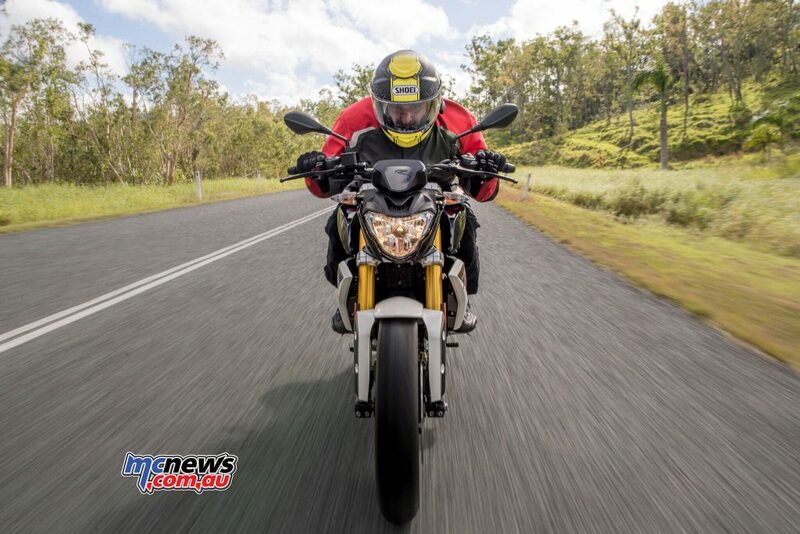 Stuart Woodbury, editor at Australian Motorcyclist Magazine, is one huge unit, and he had no problems on the machine, in fact the big bugger was an impressive sight to behold as he charged the ‘little’ BMW around the Proserpine kart track. The standard seat height is 785mm with a 10mm lower offering available as an option, along with a 815mm high comfort seat. 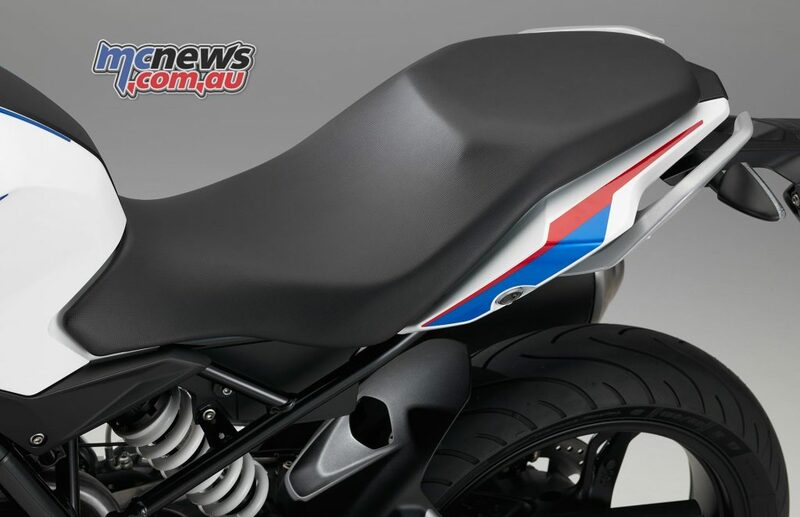 The slim girth of the machine and modest 158kg wet weight should help those short of leg to gain confidence on the G 310 R.
Considering most Australian states now preventing learners from carrying passengers until they are 94 years old and accompanied by both grandparents, pillion appointments are somewhat a moot point for our heavily constrained learners. 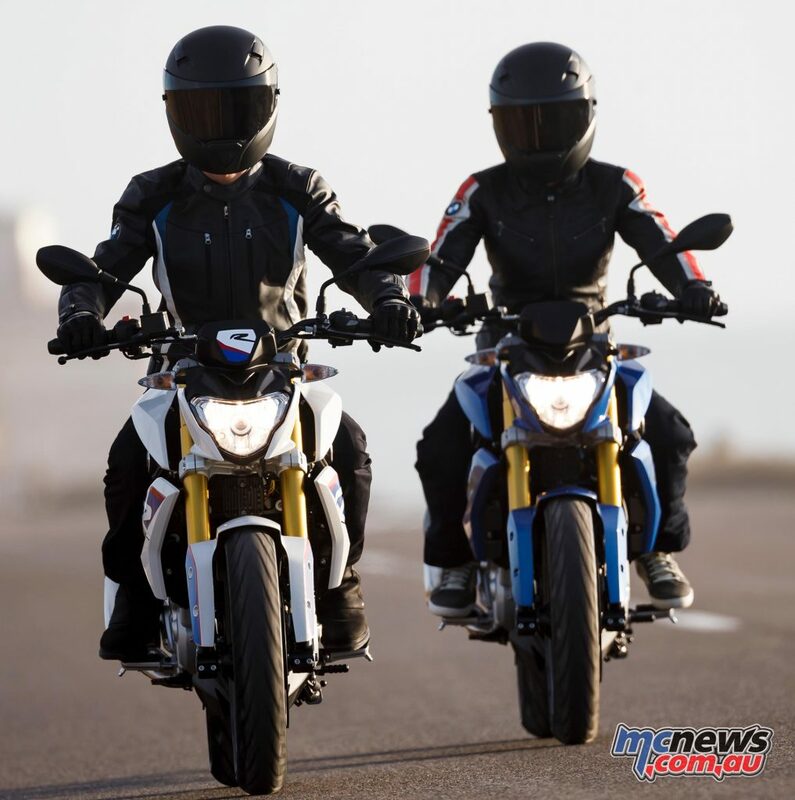 Still, the pillion accommodations consist of a small but relatively well padded perch with excellent grab handles, which will also pull great double duty should you want to strap some luggage to the back of the machine. And of course it might aid those in some countries that are forced, by way of economic necessity, to use a motorcycle as their family transport. 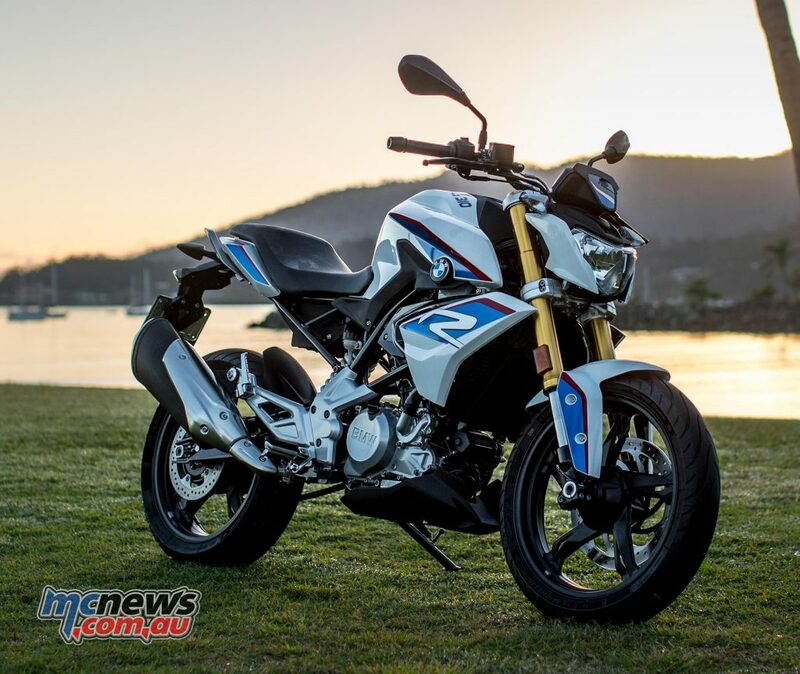 In fact, BMW quote an incredible 186.5kg payload limit for the G 310 R, that shades plenty of large capacity motorcycles in regards to carrying capacity and adds credence to BMW’s claims that the G 310 R is a proper full size motorcycle. Aesthetically I really quite rate the BMW. At first I thought the traditional BMW motorsports colour scheme was by far the only good looker, but as the day progressed I warmed to the other blue and black colour schemes also. The build quality looked quite impressive and all the fasteners, an area where all too common costs are cut, appeared very sturdy with Hex headed bolts featured throughout the bike. However, some of the fasteners had started to tarnish ever so slightly, a few days parked outside in the salty air of Cannonvale prior to the launch no doubt the culprit. A spray of WD or silicon spray on all the bolts now and then should help them stay looking new. Some of the traditional BMW niceties like traction control, standard heated grips and fully adjustable levers are missing from the G 310 R to help achieve that $5790 +ORC price point, as you would expect. However, a reasonable toolkit is supplied under the seat, where there is perhaps enough room to also fit a small puncture repair kit. BMW certainly has an attractive and viable contender in the hotly contested LAMS learner market and it will be very interesting to see just how many sales it can steal from other brands. 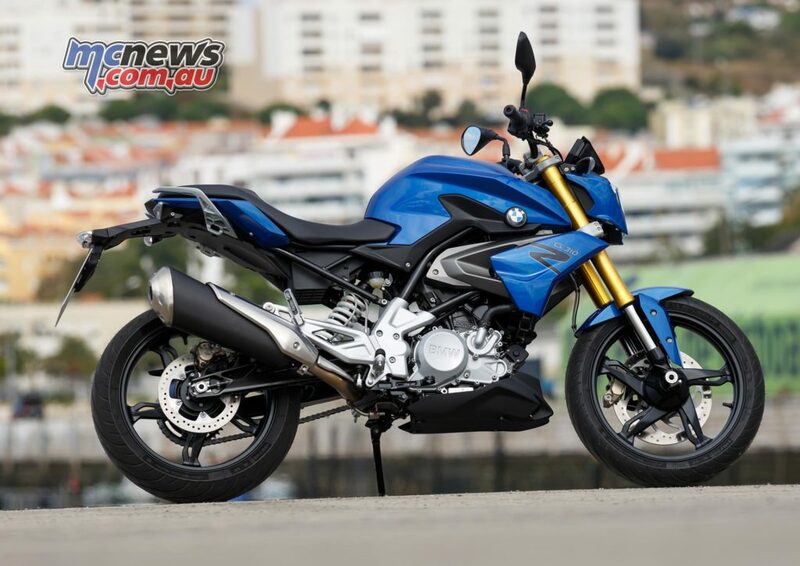 Perhaps the limited number of BMW dealerships across Australia, in comparison to other brands, might perhaps be the biggest hurdle for BMW to overcome in getting as many eyeballs as possible to consider the G 310 R. It certainly seems there up for a red hot crack at it though, and that’s good news for consumers. Gearbox – Synchromesh 6-speed transmision Integrated in the motor housing.